Using your IP address and browser settings, Google determines your general location and tries to customize your search by displaying local results in that country’s language. For most, this system is very useful, but for travelers and expats it can be a pesky nuisance when trying to access information from a different country. Fortunately, there are ways around it. 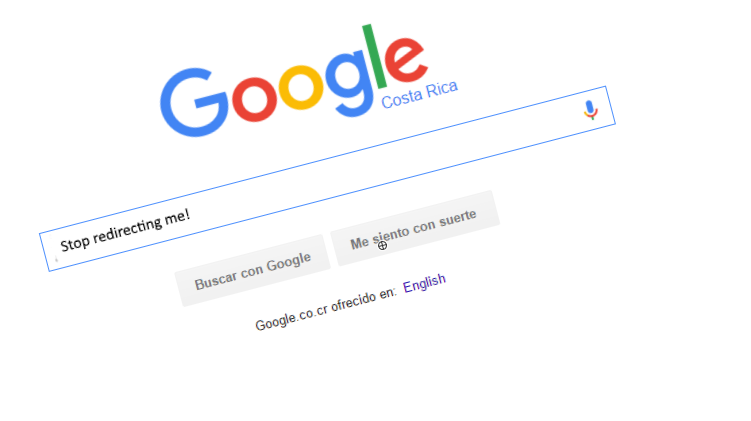 Here are a couple of tricks to avoid having your searches redirected to www.google.co.cr while in Costa Rica. The easiest way to search without being redirected is to add “/ncr” to the end of your target country’s Google URL. This stands for “no country redirect” and can be used in any browser address bar. Using URLs such as these will guarantee that you won’t be redirected to your local country’s search results page. All of today’s major browsers allow you to make a Google search either directly in the address bar or through a permanent search box. Avoiding redirects in IE and Firefox requires a little hacking, but Chrome makes it simple to specify which Google URL will be used when searching through the Omnibox. Here’s how set it up. Scroll down and click “Manage search engines.” From here, you can choose from one of Chrome’s default search options or create your own. Create a name for your search engine (i.e. Google UK) and a custom keyword (i.e. google.co.uk). Now hover over your newly created search engine option with the mouse and click “Make Default.” All of your Omnibox searches should now take you to that country’s Google results page. Whether you are in the Costa Rica on business, for vacation or just want to see a specific Google page, these tricks should get the job done for you.